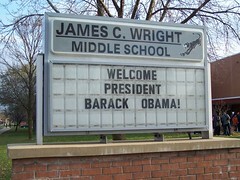 Students at a Madison school get ready to greet president Obama. It’s the first presidential visit to Madison since the Harry Truman administration, and student Shurone Carter is looking forward to being a part of history at J.C. Wright Middle School. “I feel very excited,” said the 7th grader at the school on Madison’s south side. “This is my first time seeing a president. He also hopes to hear words of encouragement from the president, a thought echoed by Wright student Jacel Schwartz. “I hope he talks about kids needing to read more,” she said, adding that she has a couple of friends – though not in Wisconsin – who can’t read.